• To increase public awareness regarding the citizenship and leadership aspects of the Air Cadet program at the national, provincial and local levels. In the Air Cadet program, we use words such as leadership, teamwork, self-discipline, self-confidence, good citizenship. 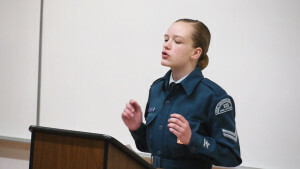 Cadets who participate in the effective speaking program will learn all of these things. The skills they learn here will help them immeasurably in other areas of their life as well, whether they are making class presentations in secondary school, or later, interviewing for admission to professional faculties at universities, making presentations to colleagues at work, leading volunteer organizations, running for public office. With the stated Aim above, we are fortunate that we have volunteers from local Toastmasters’ Clubs that, as a guiding framework, are able to use the Toastmasters’ Youth Leadership Program. Learn more about this program. For the 2018-2019 Training Year our Effective Speaking and Debate teams will be meeting at William C Winegard PS located at 25 Lee St, Guelph, ON N1E 7E7. Map Our first meeting will be on Monday 22th October, 2018 and runs until the end of Apr 2019. The night will start at 6:00 PM and will be over by 7:00 PM and them some of the candidates will go to the Drill Team Practice at the same location. It is never too late to join and as new members are always welcome.